In 2018, that is 180 years after Paweł Edmund Strzelecki began his journey through Pacific, we plan to retrace the steps of our great compatriot, the first polish explorer to sail around the world. More detailed description of his journeys can be found in Editorial section. In the attachment you can check journeys' map and table, scheduling subsequent steps of our voyage on board of “Lady Diana” (9 persons yacht type Van de Stadt 44) – designed by a famous Dutch yacht constructor. This very yacht has already circumnavigated the North Pole. 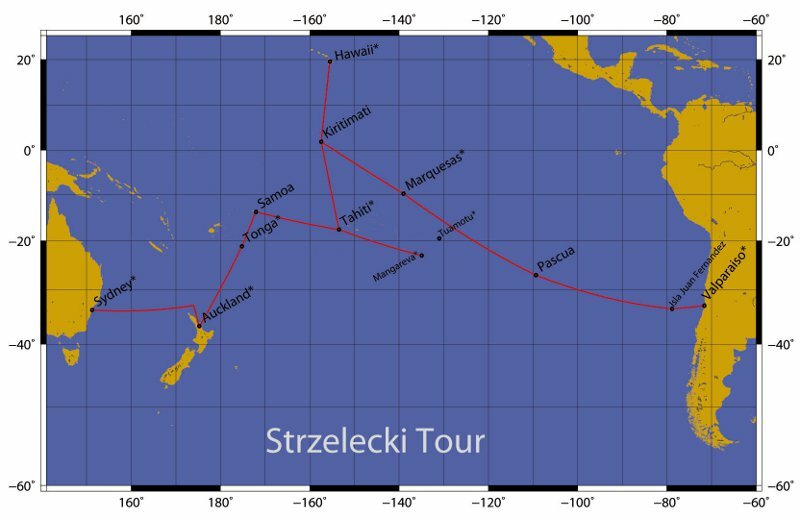 The route we want to take is as close to the actual route of Strzelecki as possible. Several planned deviations from the original route will take us to places it would be a pity to miss out. 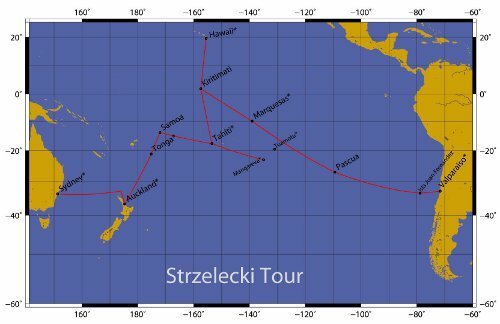 Strzelecki, on his way from Valparaiso to Hawaii, stopped only on Marquesas https://en.wikipedia.org/wiki/Marquesas_Islands, while we wish to split it into four legs, with added stops on Easter Island https://en.wikipedia.org/wiki/Easter_Island, Kiritimati https://en.wikipedia.org/wiki/Kiritimati. There will also be a possibility to visit Robinson Crusoe Island https://en.wikipedia.org/wiki/Robinson_Crusoe_Island located in the archipelago of Juan Fernandez Islands https://en.wikipedia.org/wiki/Juan_Fern%C3%A1ndez_Islands. From Nuku Hiva, the largest island of the Marquesas we plan to sail to the Christmas Island – Kirimati, part of the insular country Kiribati https://en.wikipedia.org/wiki/Kiribati, located in the archipelago of Line Islands https://en.wikipedia.org/wiki/Line_Islands, to visit a town called Poland. In Hawaii we will visit the port citie of Hilo. During the Tahiti – Tahiti leg of our voyage, we will visit Mangareva https://en.wikipedia.org/wiki/Mangareva in the archipelago of Gambier Islands https://en.wikipedia.org/wiki/Gambier_Islands, and Tuamotu Islands https://en.wikipedia.org/wiki/Tuamotus. The distance from Tahiti to New Zealand we plan to divide into three parts, with stops on Samoa https://en.wikipedia.org/wiki/Samoa and Tonga https://en.wikipedia.org/wiki/Tonga. Our destination in New Zealand is Auckland https://en.wikipedia.org/wiki/Auckland. This is the final destination in this part of our Pacific voyage. The length of each leg of the journey is planned in such a way, which will allow us some free time to 'wander around' each place we visit. From Valparaiso to Hilo your skipper will be me – Henryk Wolski. On Samoa I take the helm again, and we sail for New Zealand. Additional information about the yacht can be found here www.ladydana44.pl. You can ask for help with arranging your flights here: Travel Agency “Kiribati Club” http://www.kiribaticlub.pl/. Description of the journeys of Strzelecki can be found in Editorial section. Soon we will be presenting other cruises on board of 'Lady Diana'. The crew exchange stops all have airports. Exact route and the times can be viewed on the map below. Places written in bold and bigger letters are beginning/end places for each step of our voyage. All of these places have airports. Places visited by Strzelecki during his journey are marked with an asterisk*. Dates written like this: 17/18 mean disembarkation/embarkation – at noon.